Tonight, Kathleen and I went to see a preview screening of “Exporting Raymond“. This is a documentary about adapting and remaking “Everybody Loves Raymond” in Russia. I’m not a big TV watcher, so I’m only dimly aware of this show, but I hear it was quite popular for a long time. And the story of trying to translate it into Russian culture was very entertaining. 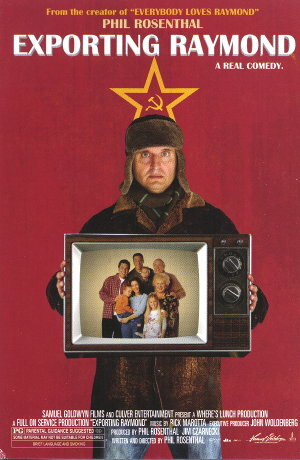 The film was made by and centers around Phil Rosenthal, who was the creator of “Everybody Loves Raymond”. He narrates the film, and he’s in almost all of it, as it chronicles his trips to Russia to advise the producers there about casting and acting to re-create the show. In the end, it’s just a silly sitcom, but to see it this way with Phil as your guide, it’s really hilarious. Phil was at the screening, and he took questions at the end. He was just as funny in person as in the film. So overall, we really enjoyed this.